President Bush is in Africa this week, sulking because he didn't get his way. In one of the rare times the past seven years, the House of Representatives, now under Democrat control for the first time in 12 years, defended the Constitution and refused to allow the President to bully it with a program of fear mongering. He really tried, though. In a Feb. 15 speech, the President, mad at yet another delay in voting on the Protect America Act, harrumphed, “[B]y blocking this piece of legislation our country is more in danger of an attack. … [T]he House leaders must understand that the decision they made to block good legislation has made it harder for us to protect you, the American people.” Not through with his saber-rattling, the President declared that not only would he veto an extension he would cancel a scheduled visit to five African nations and, maybe for all we know, hold his breath until the House acquiesced to his will. However, the most controversial part of the Protect America Act was that it gave immunity to several national telecommunications companies, which had willingly acceded to government requests to illegally and secretly monitor the phone conversations of millions of American citizens. If the 40 lawsuits currently on file were to proceed, significant information about the government's illegal and unconstitutional actions the past six years would be revealed. With several provisions still under discussion, the House leadership agreed to a 15-day extension, and then proposed another 21 day extension. That's when George W. Bush got really mad, and played the only card he had in his hand, the fear card. It worked innumerable times before; he'd just trump those other silly useless cards, like the civil liberties card. This time, the President's threats didn't work. The House was firm that because of a refusal by the Administration to budge on any part of the Protect America Act, more time was needed to try to reach compromises that would still protect Americans, yet not continue to tear at the Constitution. George W. Bush put what was left of his tail between his legs, didn't veto anything and did go to Africa. Even if the House didn't fall over, as it had so many times before, Americans had nothing to worry about any loss of protection against terrorism. In August, Kenneth Wainstein, assistant attorney general for national security, said that even if the law expired in February, “intelligence officials would still be able to continue eavesdropping on already approved targets” for six more months. President Bush, who several times had threatened Congress to rush the Protect America Act into law, “is attempting to rattle Congress into hastily expanding his own executive powers at the expense of civil liberties and constitutional protections,” Richard Clark wrote in an OpEd column for the Philadelphia Inquirer . Clarke had been assistant secretary of state for intelligence for Ronald Reagan, special intelligence and security advisor to George H.W. 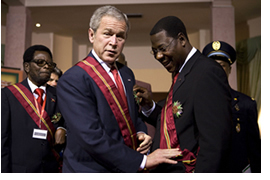 Bush, and chief counter-terrorism advisor to Bill Clinton and George W. Bush. During the past seven years, the Bush–Cheney Administration has shoved fear into Americans' hearts as a replacement for the Constitution. This Administration rushed a willing Congress into passing the USA PATRIOT Act, which cuts into several Constitutional protections, and then led Congress to vote to extend or delete most of the provisions of the sunset clause, which would have terminated 16 of the most odious, and unconstitutional, parts of the Act. The Bush–Cheney Administration has gotten a fawning and mentally-limp Congress to pass the Military Commissions Act of 2006, which allows the federal government to hold “any person,” foreign as well as citizen, who does not show “an allegiance or duty to the United States,” or who speaks out against the government's policies, to be tried by military tribunal. The Act further provides for the suspension of the right of habeas corpus , thus condemning individuals to years of imprisonment without knowing the charges and without seeing any evidence. The law permits secret trials for both citizens and aliens. According to the Act's provisions, “no court, justice, or judge shall have jurisdiction to hear or consider any claim or cause of action whatsoever” regarding anyone the Administration brought under its own jurisdiction, thus nullifying most of the Bill of Rights. The Military Commissions Act also disregards Geneva Conventions and international law for the humane treatment of prisoners, permits hearsay evidence in trials, and the right of the government to impose the death sentence on prisoners based upon the testimony of others who may have been tortured. Apparently, President Bush hopes that the people of Benin, Ghana, Liberia, Rwanda, and Tanzania will give him the standing ovations so few Americans extend to him.